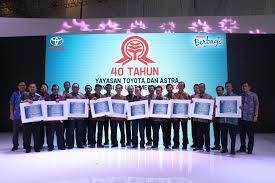 Toyota and Astra Foundation (YTA) has reached its 40th year existence. On its 40th anniversary, YTA promotes its contribution to education by cooperating with several Top Universities in Indonesia. YTA continually strive to improve the quality of graduated students from the Faculty of Engineering in this country. YTA not only donated to the Universities, but also to the Vocational High School. YTA would like to continuosly contribute to Indonesia's automotive industry. On the Toyota and Astra Foundation Anniversary, TOYOTA INDONESIA CSR donated cars as a teaching aid to workshop or laboratory at Faculty of Engineering in the chosen Universities and High Schools. Moreover, YTA also conducted a General Lecture with "College Student Facing the Future: to be a Global Scale Engineers" as the theme. This general lecture is one of YTA's contribution activity to Indonesia's young generations.